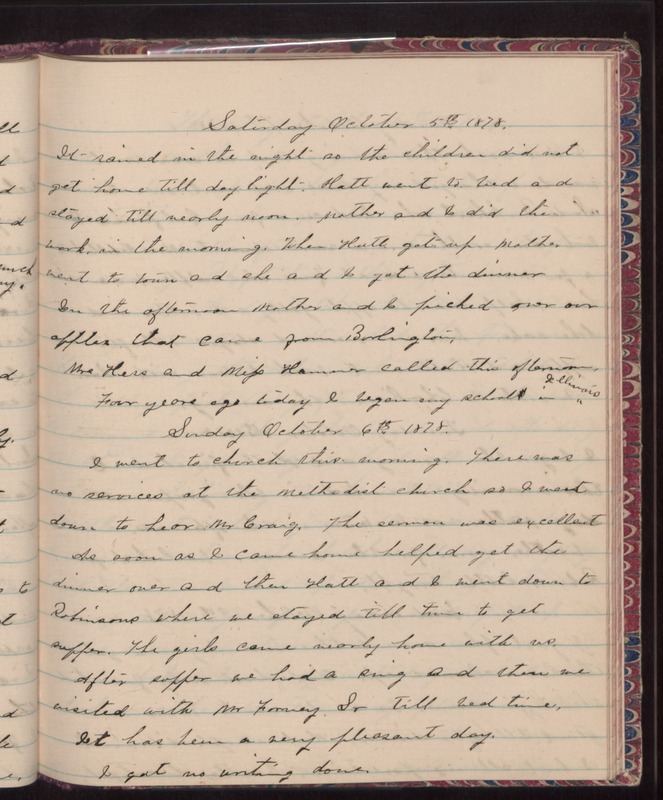 Saturday October 5th 1878 It rained in the night so the children did not get home till daylight. Hatt went to bed and stayed till nearly noon. Mother and I did the work in the morning. When Hatt got up mother went to town and she and I got the dinner. In the afternoon Mother and I picked over our apples that came from Burlington. Mrs Hess and Mifs Hammer called this afternoon. Four years ago today I began my school in Illinois. Sunday October 6th 1878 I went to church this morning. There was no services at the Methodist church so I went down to hear Mr. Craig. The sermon was excellent. As soon as I came home helped get the dinner over and then Hatt and I went down to Robinsons where we stayed till time to get supper. The girls came nearly home with us. After supper we had a sing and there we visited with Mr Forney Sr till bed time. It has been a very pleasant day. I got no writing done.